To better inform all the world leaders and government bodies about the urgent status of climate change and its link to the livestock industry, thus assisting them in making better decisions that would bring lasting benefits for people and the planet, Supreme Master Ching Hai began a global campaign in September, Golden Year 6 (2009). 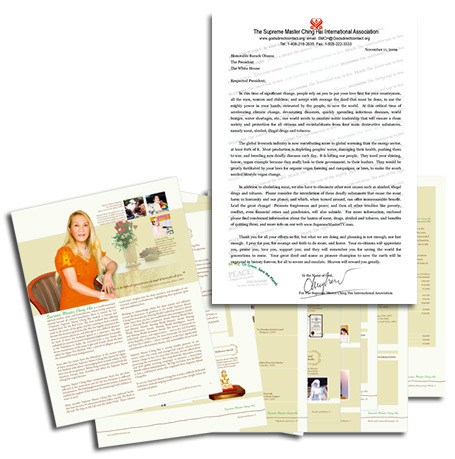 Along with a letter conveying Her personal plea—addressed to all nations' presidents, prime ministers, members of parliament, other government representatives and the press—was an information package containing the SOS flyer, "The Harms of Meat/Drugs/Alcohol/Tobacco and the Benefits of Giving Them Up," Vegetarianism in Religion," and the Supreme Master Ching Hai Press Kit. Soon after our Association members from around the world sent out Master's letter and the information package, positive responses began arriving. By the end of September, reply letters had been received from a range of countries, including Australia, Belgium, Brazil, Cameroon, Canada, Columbia, Costa Rica, Cyprus, Formosa, France, Germany, Hong Kong, Ireland, Malaysia, Malawi, New Zealand, Norway, Poland, Puerto Rico, Scotland, South America, Spain, the Netherlands, USA and West Indies. The following are some selected excerpts from that correspondence. Senator Scott Ludlam from Australia offered his words of encouragement. "I am happy to see that we share the same concerns regarding the environment. Be assured that the Greens are committed to promoting environment-friendly policies as sustainability, which is one of our main pillars. Only sustainable policies will ensure the survival of the planet and offset the ongoing damages that are being done to our habitat. I support real changes in Australian society and I will continue to do so in the future." Mr. George Gilkinet, Député Fédéral ECOLO replied, saying, "The fight against global warming must surely be everyone's campaign and I thank you for your contribution. Today, it is the only way to leave a habitable Earth to our future generations. For this reason, the lessening of meat consumption is part of the proposals that we support within the confines of where we sit. In the same way, we encourage the development of organic farming whereas it allows the production of quality products in the heart of sustainable farming. These are two steps among others for promoting more sustainable lifestyles and eating habits." Mr. Douglas G. Martin, Mayor of Fort Erie, Canada, detailed the city's efforts to promote and encourage environmentally friendly and responsible lifestyles to its employees, families, and residents, such as the elimination of plastic water bottles, recycling programs, plus promoting energy and water conservation. He also commended Master for Her humanitarian work and relief efforts around the world, saying, "I wish you and your organization continued success." Costa Rican Governor and Minister of Finance, Ms. Jenny Phillips Aguilar, said, "I write to you with deep gratitude for your interest in improving the world we live in for the sake of every living being, and for honoring me with your kind note dated September 7, 2009. At the same time, I thank you reciprocally for your blessings." The president of Cyprus, Mr. Dimitris Christofias, expressed his sincere appreciation for the interesting information from Master. He conveyed his wishes for Master's every endeavor. The Department of Public Affairs replied on behalf of the Presidential Office of the Republic of China, (R.O.C.) saying, "Mr. President sincerely admires your precious opinions regarding your concern about global warming and the natural, ecological lifestyle that protects the environment. Mr. President especially asked us to send his regards. Your great suggestions will be kept for our future reference." Executive Yuan of the ROC's Environmental Protection Administration, showed enthusiastic support, saying, "In order to awaken the citizens to join the task of reducing carbon emissions, and to have this task incorporated in their daily lives, this administration began promoting the "Campaign of Reducing Carbon Emissions for All Citizens" on June 5th, 2008, and offered 10 ways of reaching the goal, which includes "More vegetables, less meat"—using more local foods and materials; one day a week or one meal a day should be vegetarian." The current New Zealand Member of Parliament representing the Green Party and Spokesperson for Health, Mr. Kevin Hague, thanked Master for Her letter "regarding vegetarianism and its undeniable relationship with the environment and climate change." He informed Master that he is a vegetarian himself and shared the Party's Drug and Alcohol policy. Minister of the Royal Ministry of the Environment of Norway Mr. Erik Solheim responded sincerely, "Thank you for your letter in support of our common efforts towards a more sustainable future. Global warming poses great challenges for all people. I share your concerns for the towering consequences of climate change. Every effort therefore should be made to cut global greenhouse gas emissions, and support increased resilience in vulnerable societies and ecosystems. I find strength and inspiration in your support, and wish you the best of luck in your own effort towards a better world." The Director and the Deputy Director of the Department of European Union and International Cooperation, Mr. Julian T. Krzyzanowski and Ms. Monika Tyska Solek, wrote in their reply letter, "We wish to assure you that the Ministry of Agriculture and Rural Development of the Republic of Poland is making an effort in promoting organic food consumption and a healthy lifestyle through educational programs, which are also directed to enrich the younger generation. For the Ministry of Agriculture and Rural Development of the Republic of Poland, the issue of the climate change and its impact on agriculture or global hunger is a matter of great importance, and activities in these areas are undertaken in the framework of international organizations." Mr. Jose Luis Dalmau Santiago, Speaker of the Partido Popular Democratico, replied, "The information shared by The Supreme Master Ching Hai International Association is truly interesting. I will consider these concepts in my personal life and I will promote them among other people, as much as possible. I encourage you to enthusiastically continue your noble work of trying to make our people aware of the importance of a healthy diet in the development of our health." Ms. Tilly Gasela, Chief of Staff of the Ministry of Human Settlements, acknowledged the receipt of Master's letter and said Her proposal makes very interesting input and shows that a lot of thought and research has been conducted on these subjects. She thanks Master for Her interest in improving people's lives and agreed, "Indeed together we can do more!" Mr. J.P.H. Donner, Ministry of Social Affairs and Employment in the Netherlands, thanked Master for Her suggestions and Her commitment to change the world. He said, "Although the matter concerned has the attention of the government, cognizance of your suggestions may be of importance to the development of our policy." Mw. Drs. A.A.M. Roholl, Head of the Climate and Energy Department in the Netherlands stated, "Sustainable development is a priority in the Netherlands' national and international policies." The President of the United States, Mr. Barack Obama graciously thanked Master for sharing Her thoughts. He wrote, "Healthy living is an integral part of improving the quality of life for all Americans. My Administration has already coordinated forums around the country to discuss best practices for health reform, including healthy living….At the White House, Michelle is raising awareness about healthy living by planting a vegetable garden and contributing produce to homeless shelters….As I work with Congress to reform our health insurance system, every American understands that healthy habits in our own lives contribute to a healthier nation. With exercise and a balanced diet of nutritious foods, we can curb the effects and decrease the prevalence of childhood obesity, diabetes, heart problems and other chronic conditions that afflict many Americans." Mr. Adrian M. Fenty, Mayor of Washington DC, USA, also expressed his thanks to Master for sharing Her thoughts about climate change and abolishing meat. "My administration," he affirmed, "is fully dedicated to protecting the environment and I always welcome input from the community regarding such important topics." In his letter, Mr. Roger Manno, Maryland State Delegate, mentioned his own interest in organic farming and was pleased to inform Master that he has passed into law the "Maryland Organic Transition Incentive Pilot Program," to assist in the change to more organic agricultural in Maryland, where "a $100 per acre subsidy would run for up to 3 years." He added, "Rest assured that I will strongly consider your comments and thoughts on other legislation in this area." Senator the Honourable Martin Joseph, Minister of National Security, Trinidad and Tobago, appreciated the information on the benefit of abolishing meat, alcohol, illegal drugs, and tobacco. He has also taken the opportunity to share same with the various Heads of Departments. "We thank you kindly and may God continue to bless you." He wrote. In this time of significant change, people rely on you to put your love first for your countrymen, all the men, women, and children; and accept with courage the deed that must be done, to use the mighty power in your hands, entrusted by the people, to save the world. At this critical time of accelerating climate change, devastating disasters, quickly spreading infectious diseases, world hunger, water shortages, etc., our world needs to emulate noble leadership that will ensure a clean society and protection for all citizens and co-inhabitants from four main destructive substances, namely meat, alcohol, illegal drugs, and tobacco. The global livestock industry is now contributing more to global warming than the energy sector, at least 80% of it. Meat production is depleting peoples' water, damaging their health, pushing them to war, and breeding new, deadly diseases each day. It is killing our people. They need your shining, heroic, vegan example because they really look to their government, to their leaders. They would be greatly facilitated by your laws for organic vegan farming and campaigns; or laws to make the much needed lifestyle vegan change. In addition to abolishing meat, we also have to eliminate other root causes such as alcohol, illegal drugs, and tobacco. Please consider the interdiction of these deadly substances that cause the most harm to humanity and our planet; and which, when turned around, can offer immeasurable benefit. Lead the great change! Promote forgiveness and peace; and then all other troubles like poverty, conflict, even financial crises and pandemics, will also subside. For more information, enclosed please find condensed information about the harms of meat, drugs, alcohol, and tobacco, and benefits of quitting them; and more info on our Web site www.SupremeMasterTV.com . Thank you for all your efforts so far, but what we are doing and planning is not enough, nor fast enough. I pray for you, for courage and faith to do more, and faster. Your co-citizens will appreciate you, praise you, love you, support you; and they will remember you for saving the world for generations to come. Your great deed and name as pioneer champion to save the earth will be engraved in history forever, for all to revere and to emulate. Heaven will reward you greatly. South Africa Chief of Staff of Ministry of Human Settlements Ms. Tilly Gasela.